The other night I sat working at the computer when Julia wheeled her baby up into my leg. "Baby Monkey!" she declared. 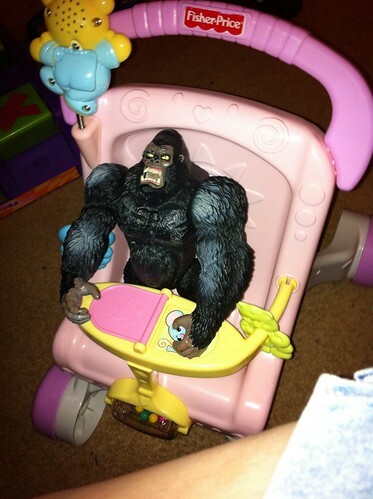 I'm not sure King Kong would agree that he's anyone's Baby Monkey. But I am interested in the babies she chooses to play mommy to. She chooses teddy bears, and dolls, and Teenage Mutant Ninja Turtles, and a pair of shoes, and obviously - King Kong. Her concepts of parenthood are wide. It's smaller than you, you take care of it and love it. That's it. She whispers "Don't worry I'm here" and I hear my own tone and inflection being mimicked. When you grow up, it never occurs to you that your baby won't be that perfect bundle of pink, somewhat Winston Churchill looking awesomeness. Even if what they hand you is perfect, you don't know what bombs are laid, errors in DNA, mistakes in that old recombinant DNA that are going to make life different than anyone else you ever knew. But the truth is, parenthood is that wide, as my two year old's vision of it. It's just that our vision narrows. We read this book called "I Love You Stinkyface" and the child asks their mom "What if..." they were this monster or that monster, extolling the horrors of that creature. The mother smiles and talks about how she would take care of them, how if they were a gross alien, she'd pack their lunch with bugs and a note that said "I love you my greenie!" Thats what motherhood is to me. I have four children. They might be King Kong, Teenage Mutant Ninja Turtles and a pair of shoes. But they are mine. And they need never to worry.